You guys, the book I'll be reviewing today contains so much hope and has such a good content I actually might faint because of it. This was so unexpected! 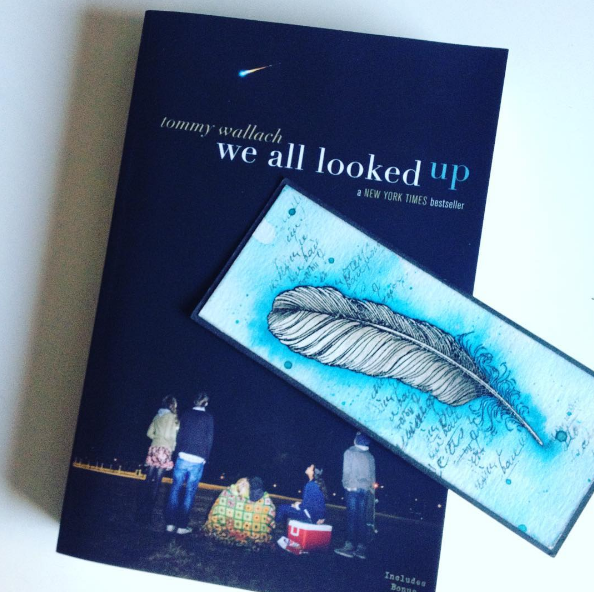 A book I bet a lot of people would absolutely enjoy: We All Looked Up by Tommy Wallach. I am so happy to review this book! Two months. That's how long everyone on earth has before an asteroid crashes down onto them and kills everyone on it. Two months to do what you always wanted to do now you still can. For some that means loving, for others that means making music, everyone has two months to find their purpose and to fulfill it. Two months of really living. Two months to really feel alive. This book has amazing characters that undergo such huge changes and that all because of this asteroid! I absolutely loved to see how each of them changes so dramatically because of it and how they'll change. This asteroid influences their life so much and I feel like that's something realistic, if everyone got 2 months to be and do what they really wanted we'd see this changes around us as well. This book follows 4 teenagers during these two months and I enjoyed each of them so much. First of all there's Peter. Peter is the good guy, the one that had great grades, is loved by everyone, is popular and so on. Yet Peter never felt like he was living, never thought he had a purpose. These two months Peter is on his way to find out what his purpose is and what would make him truly happy. Readers will really enjoy him because even though he thinks he needs to find a purpose, his gentle character won't change and that made him a very pleasant person. His actions however, will drastically change and I was a fan seeing that! Then we have Eliza, who has a connection with Peter. A year before the world was coming to an end, Peter had kissed her. He had a girlfriend! A very mean one. The girlfriend made sure Eliza already changed before the asteroid, in a girl that made guys want her. In a girl that's up for anything. Above that her father is not alright and her mother has left her a few years before. This is a character I was really curious about on how others would act around her. Eliza might act very tough on the outside but her home situation is so different. This character also changes during the last two months, she will chase love while becoming famous by her artwork. Her artwork was something that defined her even before the asteroid. Eliza loved pictures and now made it purpose to picture everything through her lens as the world is coming to an end. I felt like the author really described each important picture really well which made sure we had a very good vision on it too, and that was something that added to the story and the vibes to my opinion. However I was really into the fact that Eliza started to chase love because it's something she's been holding back for a year now and this is her trying to grab everything left in life. Then we have Andy, a character that already had a lot of potential to me from the start! Andy has a very bad home situation and basically lives on his own. Also his friends aren't a very safe situation, Bobo (his best friend) is into bad things and expects Andy to be in those things too. Andy is a people pleaser, he doesn't want to lose his best friend and therefore sticks to whatever it is he needs to do. He also didn't believe in forgiveness. This character undergoes such a huge change and he's actually my favorite in this story. Andy begins to understand what forgiveness is and how love feels. Although he had the wrong purpose in the beginning and it took him a while to see he was wrong, this character has so much good in him. His character is really gentle but funny, a lot more smarter than he leads on and so much different from what Bobo wants. I really enjoyed Andy so much because he started to realize what real friends and real love was which made him such a strong character in this book. Lastly there's Anita, a girl who's life has been all about pleasing her parents. When the end of the world was announced, she finally decided to make her last two months worth living. Anita never got the chance to do what she really loved to do: sing and now this is her last chance. Whatever it was that was holding her back, it isn't worth it. This girl grew so much, from being the hard worker, she became the girl who did what she wanted to do all her life. And she finally starts to realize who she really is and what she really wants which also made this character a very strong one. Each of these characters bring so much to the story and come together in the karass, as Andy describes it. "A group of people linked in a cosmically significant manner, even when superficial linkages are not evident. Created by Kurt Vonnegut." when this word was introduced I think I screamed because this was absolutely amazing. It brings all these characters together, one way or another, and made sure that the characters are a very strong feature in this book. I absolutely fell for each of them and enjoyed them so much! As for the plot, I actually didn't really know what I had to expect with a book like this. I didn't want it to be depressing but I also didn't want everyone to be happy about it. The author made a very nice balance between the two while the world became complete mayhem. This mayhem sure did add to all the feelings and the vibes that were going on and also made sure that the characters go to explore more and develop more so that's a great thing. But even more this plot was just so much different from what I had expected. It was a lot more action and thrill than I had expected. Now the world is coming to an end, people decided it was time to take over, others decided it was time to get together with family and yet other people thought it was a good idea to lock everyone up because others got together to talk about the people who locked people up. It's a complete mess but still very easy to follow, yet another great asset to the plot. I feel like the author really thought the plot through and probably put his finger right onto how the world would look in this kind of situation. Another thing I really loved was the fact that there'd be this big End of The World Party that brought everyone together for the end. It's just amazing to see how much hope seeps into the story just because of this. The coziness, the love, the feeling like you belong, all these words describe how it felt reading about it and how much it actually feels like the end in this book. The author did such a great thing describing the situations that it also really felt like the end was nearing and I really loved to feel that because that's what it's about! However, the book also made clear that the end might never come. Scientist weren't sure if it would destroy the world, although it looked like that with a 66.6 percentage. That made sure that the readers would feel really curious towards the end: would it be the end or not? And how would people be if it weren't the end? How would they be if it were really the end? Tommy Wallach also made sure to put different perspectives of the end in the story: people who believe, people who think there's nothing at the end and so on. The reader will really be able to think how he or she would act and what their heart would desire: the end or not? Lastly I'd really want to point out how much I enjoyed to see the different perspectives from each character as they had their own plot line. Every character backtracked part of the chapter before it so you would know what the character thought after what happened or what he or she was doing before the last part of the chapter before it. All that really came together in a very nice plot with hope written all over it. "Question: How could you look the end of the world in the face and not go crazy? Answer: You couldn't. The only sane thing to do was seek out enough distraction to numb the terror."